Norbert Dinslage, 93, of Clarkson, died Saturday, July 23, 2016, at the Golden Living Center in Clarkson. 7P.M. Rosary by the Parish and continues Wednesday 9:30, all at the church. Norbert Dinslage was born September 16, 1922, in Aloys, Nebraska to John and Katherine(Guenther) Dinslage. He attended St. Aloys Catholic School through the eighth grade, farmed and fed cattle until entering the United States Army. He served in the Pacific theater and Japan. After the service, he returned to farming and trucking. On November 27, 1952, Norbert and Elaine Renter were married at St. Leo's Catholic Church in Snyder. They started Dinslage Livestock Trucking and ran that for 24 years, moving to a farm north of Aloys. They eventually settled on a farm north of Clarkson until moving into town. 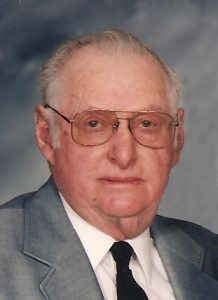 Norbert was a member of the church, lifetime member of the Knights of Columbus and VFW, past Secretary of the Dodge County Feeders Association and Holy Name organization. He helped start the Hiway 91 golf club in Leigh and the Howells Saddle Club. In 1980, he and his son started T & N Trucking Company. Norbert loved to go deer hunting in the Arnold, Nebraska area, all sports and spending time with the grandchildren. He is survived by his three daughters;Pegge(Allen) Tuma of Columbus, Pat(Tom) Pacula, Fremont and Polly(Dennis) Stumpe of Scribner, two sons;Mike of Norfolk and Terry(LuAnn) Dinslage of Clarkson, a sister-in-law, Irma Dinslage of West Point, 13 grandchildren and 16 great-grandchildren. He was preceded in death by his parents, wife Elaine, one sister, Angela Steffensmeier and three brothers, Raymond, Wendelin and Edwin Dinslage.